Provided photo The Hughes-Wilkinson House, located at 608 N. Downing St. in Piqua, is included along the 2018 Holiday Home Tour on Dec. 8. 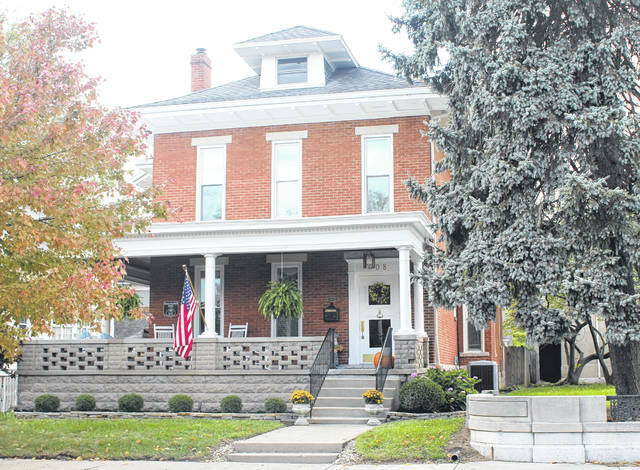 PIQUA — The Piqua-Caldwell Historic District Association’s second annual Holiday Home Tour, set for 5-8 p.m. Saturday, Dec. 8, will feature six historic homes, where tourists can stop and enjoy a sip or nip. Among the stops on the tour will be the Hughes-Wilkinson House located at 608 N. Downing St. This home was built in 1880 and is currently owned by Barb and Tom Hudson. The Hughes-Wilkinson House was moved to its present location in 1906 from two lots north (lot 184) to make room for L.M. Flesh’s mansion. The house is dominated by the slate-covered, flaring hip roof with wide eaves and low relief brackets. Hip-roofed dormers and corbel cap chimneys punctuate the roof. The elongated one-over-one windows have stone lintels and sills. A simple porch with round column supports spans the facade. A stone water table encircles the dwelling. J. Ben Wilkinson was the secretary for the Piqua Club and later went into the insurance business (The J. Wilkinson Company) in 1910. He died in the early 1950s and his business was absorbed by Stelzer & Reed Insurance (formerly Reed, Mote Staley Insurance and now Koverman Staley Dickerson Insurance). Mrs. Wilkinson lived here until she died in the late 1960s. Her father, the Rev. T.L. Hughes, lived here previously and presumably had the house built, circa 1880. Tour tickets are available at Allisten Manor’s Flower Box, Mainstreet Piqua, and Readmore’s Hallmark in Piqua. Cost is $25 per person and credit card transactions should be made at Mainstreet Piqua, 326 N. Main St., Piqua. Shelley and Chuck Black, co-chairs of marketing and advertising, recommend purchasing tour tickets early, as only 300 are available and last year’s tickets sold out several weeks in advance. Proceeds of this tour will go toward signage identifying historic homes within the district and the association’s long term goal is to place historic signs at the perimeter of the district to help accentuate the significance of these historic properties within the City of Piqua. For more information, contact the Piqua-Caldwell Historic District Association at PO Box 212, Piqua, OH, 45356.
https://www.dailycall.com/wp-content/uploads/sites/30/2018/11/web1_Hughes-Wilkinson.jpgProvided photo The Hughes-Wilkinson House, located at 608 N. Downing St. in Piqua, is included along the 2018 Holiday Home Tour on Dec. 8.